Campbell Lane which runs under Flinders Street connects Degraves Street with Flinders Street Station. 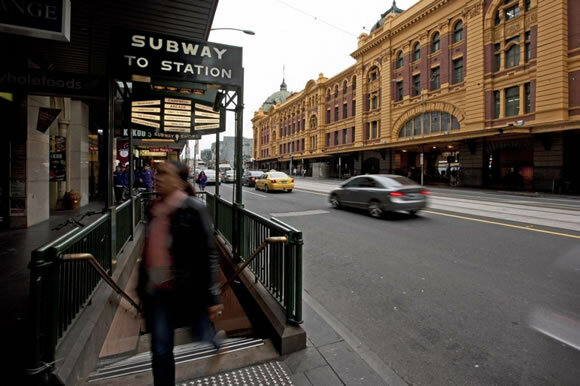 Built as station access, the Degraves Street Subway and the Campbell Arcade opened in 1955, just before the 1956 Olympic Games. According to Wikipedia, Campbell Lane is an arcade located underground off of Flinders Street and features a selection of indie merchandise, ranging from fashion and jewellery shops and a record store - Wax Museum. It also features a coffee shop - Cup of Truth. Campbell Arcade houses famous zine shop Sticky and beloved jewellery store Corky Saint Clair. The project shares its name with a 1967 film about World War II, but there's nothing combative about The Dirty Dozen in Campbell Lane. The underpass that connects Degraves Street with Flinders Street Station has long been a creative hub, home to a zine shop, a handcrafted jewellery and accessories store and an independent fashion boutique. From yesterday, Campbell Lane is also home to The Dirty Dozen, as the 12 glass cases that line the walls are now known. Occasionally dormant , the cases have been '' reactivated' ' as cabinets to display artwork , as they have in the past. It's part of the City of Melbourne's Creative Spaces program , which sources affordable space for creative people and organisations . Skunk Control, an outfit of science and engineering graduates from Victoria University, was the group chosen to launch the project. '' We do live underground, a lot of what we do is in the basement area,'' says Skunk Control member Nick Athanasiou . Their name also comes from '' skunkworks'' , a term that originated during the Cold War and refers to science and technology projects developed in semi-secrecy . Skunk Control's Campbell Lane project won't be a secret for long. Prevaricated Frequencies is an installation that sees the cases decorated with intricate plastic flowers and icicles that change colour with technology involving filters and polarised light. The effect is stunning.
'' When I went to the Gertrude Street Projection Festival to look at these guys' work, it was as much the work that mesmerised me as the people watching it,'' says Eleni Arbus, Creative Spaces program manager. Another case will feature organelles that change colour through polarisation.
'' We've actually built small cells out of organic-based materials,'' Athanasiou says. Formed in 2009, Skunk Control wasn't formalised until 2012, says member Simon Roberts.
'' We did one or two installations then it grew from there,'' he says. There are six members in Skunk Control's core group, but that number grows for installations such as Prevaricated Frequencies, which has taken eight members four solid weeks to create. Many of the members teach at Victoria University, and their students often chip in and help with projects as part of work experience. In August, the group will exhibit at Lux Festival in Wellington, the city's answer to White Night. In September, they head to Cascais, Portugal to the Lumina Festival, dedicated to the art of light.
'' It's really starting to take off now,'' Athanasiou says. The festivals and Victoria University will provide most of the funding for both trips. Roberts is quick to deflect suggestions that they are artists.
'' It's probably being creative, but I don't see us as being artists,'' he says.
'' I take a slightly different view,'' Athanasiou says. All these installations show different ways of viewing light. Campbell Lane technically is not named on maps is accessed via a stairway on the north side of Flinders Street near Degraves St. Warning: Campbell Lane is closed on Sundays and possibly Saturdays.